A subscription gives you unlimited access to some collections and all videos in our video library. Access all of our video resources! This video can help you learn about one of the basic building blocks of GST: the First Coretile. Learn about what your First Coretile is and how you can find it with this tutorial straight from Anna Rahe. This 10 minute video will show you how you can practice using your First Coretile and is a great way to deepen your understand of the concepts of GST! The only equipment you need for this video is a yoga block or something else you can prop your hips up on. Learn about GST Shaping Cues and how you can use them to analyze your posture and movement in a way that will help you identify and then work to balance your habits and other body issues, such as scoliosis. This 30 minute video will teach you an exercise we call "The Slide", which has many benefits, especially for upper hemisphere tension and pain. All you need to do this one at home, is a yoga mat and a place where you can put your feet on the wall in front of you. This one hour Movement Medicine class will take you through a slow warm up and some exercises that can teach you how to better utilize your breathing in your movement. If you do not have access to GST Vitruvian Equipment, you can modify the breathing exercises at home with your GST 3TS®. This instructional video will show you what that grey loop on your GST 3TS® is for! By adding traction to your body through your arm, you can decompress your shoulder and stretch in a new way, reducing pain and improving your range of motion. In this quick video, Stefanie will show you some wrist and hand stretches that you can do throughout your day to help counteract the stresses of your daily life and the aches and pains that come with all of the texting, typing, and driving that we do! This 3 minute video will show you a great technique to help restore a vibrational quality that will help you flush your lymphatic system, loosen joints and release excess tension in your muscles. MM: Slide right into a hip stretch! How to: Slide right into a hip stretch! This effective floor series will have you opening and stretching your hips and legs for greater flexibility and less joint pain. This sequence is especially ideal for pre-natal hip opening and to get rid of aches and pains. If you do not have sliders at home, you can use anything that will slide on your flooring as a substitute. One common favorite is a magazine or large envelope. This great hour long Movement Medicine class will take you through a variety of exercises that you can do on your own at home with just a yoga block and a mat. This class is perfect for you if you have injuries or special concerns and would prefer to start slow in order to deepen your understanding of your body and GST. This 15 minute sequence will guide you through using your 3TS in different ways to traction your body, and especially your spine and shoulders, to help reduce aches and pains and add length to your body! Use your GST Traction Bar (or any long dowel, broom handle, etc.) to help you learn how and where to lift your torso from and then put those ideas into practice by looking at some familiar GST Traction Stretches in a new way! This 10 minute video with Anna Rahe will walk you through some simple ways to practice your 1st Coretile without any extra equipment! Not only is your 1st Coretile important in your GST practice but it will also help you learn how to lengthen your spine. Follow along with Anna in this 10 minute video as she shows you a great way you can do self-bodywork at home to help create fascial release in your lower leg to help release tension, increase flexibility and more fully integrate your lower legs into the work you're doing for the rest of your body. This video will show you how to experience our compression stretching for upper body pain and tension relief. Compression stretching is a unique GST technique that will stretch and restore flow to congested tissue and help open tight joints. It will also help you understand more about how your arms and shoulders are supposed to work together and why you may be experiencing excess tension and pain in your upper body. We recommend warming up prior to doing this video. You will need a partner to do this, but you can listen along to the instructions in this video to walk you through the experience. You'll also need a couple yoga blocks, thick books or something else your partner can stand on to help them control the amount of body weight they use. Please, listen to your body when you try this and if you're not sure compression stretching is appropriate for your body, please email us at info@gstbodyla.com with your concerns so we can guide you. This quick 8 minute video has another sequence you can do on your own at home without any equipment and will help you with your ankle and foot mobility and aches and pains by releasing tension in the fascia. This video will take you through two easy ways to open your hips and work on increasing your hip mobility with your GST techniques. No equipment required! This 60 min class will take you through movements focused on opening your hips and hamstrings so you can get your lower body moving. You will need a GST 3TS to get the most out of this class. This 40 minute video will teach you about the GST® concept of Osteotectonics - or working with your bones to find better structural support for your body! The first lesson is followed by a floor exercise so you can put these concepts into action for yourself. If you don't have access to a bar, you will just need something like a counter that you can hold on to for the first part of the video. This video is great for you if you are starting from scratch at home. Learn how you can convert the GST Traction Series® from our Vitruvian Equipment to your 3TS/Traction Barre combo to help you follow along in other classes and videos. This 12 minute video will take you through a version of our GST Traction Series and a few other exercises using the GST 3TS/TTS® and Traction Bar. This video is great for people who are just beginning to do GST at home or it can also be used as a warm up before you do some of our other videos. This 30 min compilation of videos from our archive will show you some ways you can adapt GST® Traction exercises to be done in your office space! All you will need is a surface like a desk and a rolling chair. There are 5 exercise sequences in this series, so you can go from a warm up to a few strengthening exercises for your legs and abs. This 20 min class will help you both flow and practice the technique of using your KTS! This sequence includes both familiar exercises from the Intro to GST DVD® and some new exercises for you to try. This 20 minute sequence done with the GST 3TS® or TTS® will take you through some of your basic GST exercises with the straps! You can use it after a warm up of your choice to get moving on any day. Add some effort to your GST Ballet Stretches so you can start to strengthen your legs and hips while stretching your legs. You will need a GST TTS or 3TS and 25 minutes to do this video. This 45 minute warm up sequence will help you get your GST practice started off right, with our signature traction series and other exercises designed to get your chi flowing! You can do these exercises on the GST Vitruvian Euipment®, a wall mounted bar, or you can modify some of them to be done with your GST 3TS and Traction Bar®. This 13 minute video combines several GST ab exercises with our signature Siren Series cool down. It's a great way to wrap up your GST practice. This video uses the GST Body Roll-X® as well as the GST 3TS®. In this 13 min video, Anna Rahe will show you how you can use your GST to do better push ups to strengthen your upper body without causing more tension or pain. This 25 minute video will help you learn more about your hips, pelvis and SI joint and practice both releasing them and using them properly in movement with the help of your GST Body Roll-X®. CC: Get Ready to Flow! Class: Get Ready to Flow! This 35 minute class sequence will not only warm you up on the bar, but it will also take you through a fun sequence with your GST KTS® - which is a great way to prepare you for some of our new cardio sequences! This 7 minute video will give you a basic introduction to many of the GST concepts you'll hear about in our other videos. If you are just getting started, or you need a refresher course in some of our terminology, this is a great place to get started to help gain clarity and refinement! This 90 minute Conscious Conditioning class will warm you up and then take you through some new progressions of movement that are designed to help you create more flow in your movement and ultimately, in your body. This quick video will not only explain how and why your current posture and exercise routine might be hurting you, but it will also show you how you can use the new GST Back Arch® to counteract these things and gain better posture in the process! This compilation of floor exercises with Anna Rahe will show you some great examples of how you can do GST on the floor without any special equipment...besides your body, of course! This is also a great way to get a better understanding of some of the exercises from our full classes. All you need at home to follow along is a yoga mat. This great 45 minute class will take you through a whole variety of GST® exercises on the floor! You can do this sequence anywhere with a yoga mat and a yoga block to help for a few of the exercises. Enjoy a combination of stretching, ab work, continuum movement and more! This 30 minute class sequence will take you through some stretch and exploration with the weighted bar and will finish by adding some more flowing movement to tie everything together! This is a great sequence to do on it's own or as part of the rest of your at home practice. This 20 minute sequence will take you through a combination of our continuum movement and some floor exercises that require no equipment at all, so you can do them wherever you need to as part of your GST on-the-go practice. Experience our newest Beats sequences in this class that combines GST continuum movement both with and without the weighted bar. If you are doing this at home, you will need your own 5 or 10 lb weighted bar for the second part of the class, as well as a foam roller. This 15 minute standing exercise can be done anywhere you are to open new areas of your hips that will reduce stiffness, tension, and aches and pains. This 20 minute sequence will show you how to stretch and strengthen your legs and knees so you can help balance the effects of misuse to keep them healthy as you age. You do not need any special equipment for this video besides a yoga mat, although something to hold on to for balance may be helpful. One of the keys to helping your body stay feeling young is making sure your hips and knees stay mobile and strong. Use this 30 minute sequence at home with little to no equipment to help you practice your GST techniques and both stretch and strengthen your knees and hips. This 90 minute Anti-Aging class will take you through your GST warm up, a few GST facial exercises, and some simple stretches you can do both with and without your GST TTS/3TS® at home to help wake your body up and counter the effects of aging. This 90 minute class combines the best strengthening and stretching exercises to keep your body feeling young and aging gracefully! You will need a GST 3TS® and Traction Bar or some of these exercises but will also be able to modify others with what you have access to at home. This 90 minute Anti-Aging class will take you through a warm up and some specific exercises designed to help you target your legs for strengthening, health and flexibility. Class: 30 Min Warm Up Experience some of our unique Anti-Aging techniques mixed into your good old fashioned GST Traction Warm Up! You can use this sequence on its own or to warm up for the rest of your GST at-home practice. *You will need a 3TS/Traction Bar or another stationary bar to do this warm up on your own. This 75 minute class features all of your favorite parts of GST in one full class! Start with our signature Traction Series warm up and move on to not only our Anti-Aging exercises but also a bonus Beats cardio sequence and some work with our neck massager. This 13 minute video will take you through some of the unique Anti-Aging tissue and fascia flushing exercises that you can do at home without any equipment at all! This sequence focuses on specific movements that can help your body age with more freedom from aches and pains. If you've ever wondered how we do the breath you might have heard in other classes, this is the class for you. This Anti-Aging class will take you through a full class that includes a break down of some of our GST breath techniques for you, and also integrates it with your 3TS and Traction Bar® and the rest of the class exercises. Follow along in this Anti-Aging session as Anna takes you through some ideas and exercises that you can do on your own at home with your GST 3TS® and Traction Bar! This is a great way to get started if you are new to GST and need some more explanation of our Traction Series and other exercises. In the second session of this series, follow along with some GST basics and learn how you can do them at home with your GST 3TS and Traction Bar! These movements will help you move and feel better, keeping muscle flexibility, joint mobility and general health as you age. This short 7 minute Continuum Movement sequence is a great introduction to this kind of movement and will help you practice getting your body moving in a whole new way. Since is a short sequence, it can also be used to supplement other videos in our library as an add-on to other classes and exercises. This 20 minute sequence will give you some new movements to try with you GST 3TS and Traction Bar® at home! Designed especially to implement some of our Anti-Aging techniques, this is a great combination of strengthening and movement that will help your body age gracefully and healthfully. This 30 minute class will incorporate the GST Anti-Aging techniques into our continuum movement and add the resistance of a 5 lb weighted bar. You can also use your GST Traction Bar for a non-weighted version...and stay tuned for the weighted bars to be available for purchase in our store soon! This 8 minute sequence will introduce you to slow continuum movement with the added use of small hand weights to add in a strengthening component for you. This is a great sequence to introduce you to the ideas and feelings of our GST continuum movement! This 30 minute video will walk you through a way to practice directing force in your movement before finishing with upper body exercises and special Anti Aging compression stretching for your head and face. The first half of this video does not require any equipment, but the second half does require a 5 or 10 lb weighted bar. This 50 minute Anti-Aging class will start by taking some of our key GST exercises and translating them to floor exercises so you can do them anywhere you are! The first part of this class can be done completely without equipment, although you will need a foam roller and weighted bar for the second half of this class. 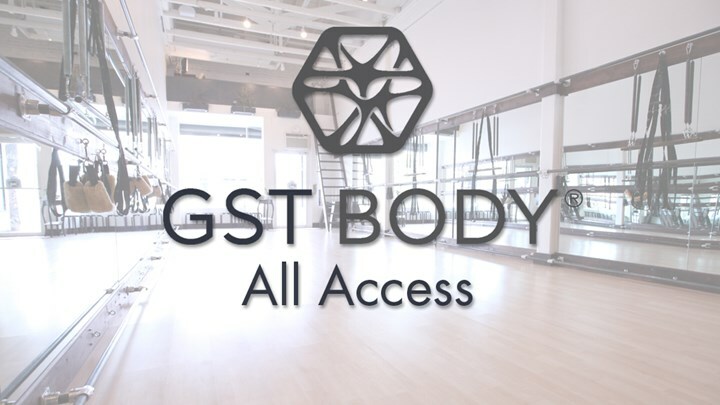 This special GST® workshop with Anna Rahe will help teach you about the anatomy of your muscles in both your upper and lower body. In Part I of this lecture, Anna talks about how different muscle structures work and how they in turn affect your movement. Put what you learned in Parts I to practice with some GST movement exercises, including some of the GST Traction Series, as well as exercises done on the Vitruvian Equipment Springs. You can modify some of these exercises to be done with your GST 3TS and Traction Bar also. If you have not watched Part I, we recommend starting there to learn more about the concepts behind these exercises. Check out our new Momma Body Care Workshop! In Part I, Anna Rahe gives a lecture about the concepts of GST that can help you with your pre and post-natal Momma Body Care for the first house and then moves on to putting those concepts into practice in the second hour. The practice includes simple exercises that you can do at home with your GST 3TS® to strengthen your body both pre and post baby. Part II of our Momma Body Care Workshop will cover some simple floor exercises that you can do on your own at home to practice your GST techniques and condition your body to help with the demands of your pregnancy, delivery, and life keeping up with your new baby! You'll also learn about things you can do at home to help release your fascia and muscles and alleviate your pre and post-natal related aches and pains. Focus on your glutes and hips first with the GST Body Roll-X and then move on to your neck with our hand neck massager. This one hour lecture will introduce you to the basic ideas of GST Somachology, including body analysis and emotional body mappings so that you can access your emotional body through the mind-body connection! Stay tuned for Part II, which will show you how you can use GST exercises to help you open up and explore different aspects of your emotional body. Join Anna Rahe and Crystal for this intro to our Momma Body Care series, where they'll start off by talking about GST for pre & post natal work. Each video will be labeled with the week of the pregnancy that it corresponds to. For example, this first video addresses week 6 of Crystal's pregnancy. The first installment of our Momma Body Care Series continues with this 70 minute video that will take you through some of the basic exercises you can do at home for your pre or post natal body care. You will need a GST 3TS® for some of the exercises included in this video. Stay tuned for the rest of our Momma Body Care Series, with new installments coming out weekly! Join and Anna and Crystal for Crystal's 8th week of pregnancy and put your GST into practice with a gentle warm up and some ab work that you can do while you're pregnant. For week 9, we're bringing you some simple exercises you can do at home to get some traction on your spine, open the front line of your body, and even some suggestions for how a friend or your partner can help you release some of the headache tension you might be experiencing during your pregnancy. Join Anna Rahe and Crystal as they work through Crystal's 10th week of her pregnancy, with some 3TS exercises, as well as a floor exercise to help you strengthen your legs. Join Anna Rahe and Crystal for Crystal's 11th week of pregnancy as they cover different strengthening exercises that you can continue to do during your pregnancy. For this week's installment, Anna is in her 20th week of pregnancy and Crystal is in her 12th! This week, Anna goes over some more exercises that can be done at home on the GST 3TS®, as well as a floor based exercise that is great for strengthening the abs and helping to set up the pelvis for childbirth. This week, get an introduction to using the GST 3TS® and Traction Bar at home so you can follow along on your own! You'll also see a variety of new exercises to you can keep mixing it up. Join Crystal for her 14th week of pregnancy as you learn some exercises you can do at home with your GST 3TS® and Traction Bar so you can keep strengthening your body, even when you're expecting! Week 15 is here! Follow along with this great pre-natal workout that you can do at home with your GST 3TS and Traction Bar, among other things. This week includes both familiar exercises and some new ones to give you more variety. This week, join Crystal and Anna as they show you some effective ways to release the kind of tension that can be contributing to your pregnancy related aches and pains - especially headaches! Join us for the 17th week of Crystal's pregnancy, with another great pre-natal GST workout. In addition to some exercises that you'll recognize from earlier sessions, this week also focuses on some new ways you can use your GST 3TS and Traction Bar for more variety at home. For Week 18, we're bringing you another great session with Crystal that will show you how you can continue to strengthen your body in a healthy way during your pregnancy. This week, follow along with Crystal's session and try out some new ways you can use your GST 3TS® at home in this more stretch oriented pre-natal session. Every week of our Momma Body Care series can also be used for post-natal workouts to help you get back in touch with your body after delivering your baby! This week, follow along for more of a therapeutic session with Crystal. You'll get to do some of the GST Traction Stretches, and then learn some special manual GST Bodywork techniques that will help you create more space in your upper body as your baby grows. Join Crystal and Stefanie this week for some new stretches and exercises you can do to help condition your body during pregnancy. Crystal also tries out the GST Roll-X in this session, which is great for releasing your own tissue at home. This week, join Crystal and Anna as they explore some ways you can strengthen your body during your pregnancy. Use your GST 3TS and Traction Bar® to follow along at home. This video also ends with a simple arm strengthening exercise you can do at home with just a yoga mat and a set of hand weights. This week, continue strengthening your momma body with the GST 3TS and Traction Bar! This video also includes a great hip opening and strengthening stretch that you can do on your own at home, with nothing more than a yoga mat. This week, Anna and Crystal add an exercise ball to our Momma Body Care routine, so if you have access to one of these at home, this is a great session for you to watch! Using the ball can help you gently stretch your abs and spine, as well as give you some extra support for other exercises as you experience the benefits of GST for your pre or post-natal body. This week, join Crystal and Stefanie for a stretchy session that can help you when you're feeling the aches and pains of your pre or post-baby body. All you'll need to do these exercises at home is your GST 3TS®! This week, follow along with Crystal to try some strengthening exercises that you can still do during your second and third trimesters. This workout features both the GST 3TS and the exercise ball so you can do the whole session or choose to follow certain parts to help safely condition your momma body! This week, Anna and Crystal focus on some new exercises you can do on your exercise ball, including both strengthening and stretching exercises so you can focus on what you need most for your momma body. Continuing with a focus on healthy strengthening for your momma body, this session includes exercises with hand weights and more work on the exercise ball, which will be helpful for both pre- and post-baby workouts! This week, Anna will guide Crystal (and you at home!) through a great overall review of a variety of exercises you've done in our Momma Body Care sessions so far. If you want a little bit of everything for your pre or post-baby body, this is a great session to follow along with. For this week's session, Anna and Crystal focus on a variety of GST 3TS/Traction Bar® exercises so you can add to your repertoire with versions of exercises that you might have seen featured in some of our full classes. This session also concludes with some gentle stretching to help you open your front body and create space for your growing baby bump. Continue along Crystal's journey with week 32 of her pregnancy. This week, see good examples of strengthening exercises that can still be done in your third trimester, along with some great stretches to keep lengthening your momma body. This week, join Crystal and Stefanie for some gentle stretching and lengthening to help care for your momma body and all its aches and pains. You'll get a review of your traction stretches before you do some stretches on the floor that can easily be done wherever you have space at home. Join Crystal and Anna (post baby!) for Week 35 of Crystal's pregnancy, as Anna leads her through some strengthening with the GST 3TS and Traction Bar® before adding a new upper body tissue release that you can do at home with a foam roller. Join Crystal as she gets towards the end of her third trimester and follow along with exercises that will continue to help you as you get closer to giving birth! You may almost be at the end of your pregnancy, but you can still do GST! This session with Crystal will review some of the exercises you've done before, using them to help condition and open your body right up to your delivery. Join Crystal and Stefanie for the last session of Crystal's pregnancy! This gentle session will help lead you through some opening stretches to alleviate the extra body tension you'll have at the end of your pregnancy and review the GST concepts you've been learning as a part of your Momma Body Care. This video with Anna will introduce you to some of the basic concepts behind GST Movement Medicine and help you understand why you have pain and what you can do with GST to help that pain. If you are coming to us specifically for Movement Medicine, this is a great video to start with to help put your GST practice into context. AA: Using Your Weighted Bar! Class: Using Your Weighted Bar! This 90 min Anti Aging Class will take you through a warm up and a wide variety of exercises using our 3TS and the weighted bar! Explore different feelings of momentum, strengthening and release by adding the weight and movement of the bar to your GST exercises. If you do not have a 3TS, you can still do some of these exercises with a 5 or 10 lb weighted bar.